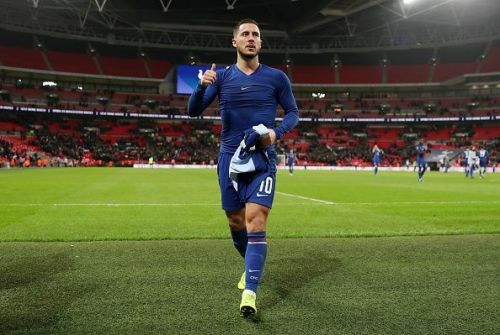 Chelsea have reportedly decided to demand a hefty price of £100 million if Belgian forward Eden Hazard tells the club he wants to leave and join LaLiga giants Real Madrid. Hazard has been associated with a move to the Bernabeu for months, with rumours intensifying further this transfer window. The 28-year-old forward has been in form for the Blues so far this season, despite concerns over the consistency of his performances. The Belgian has found the net ten times so far this campaign, while also registering ten assists for the club. Hazard reignited rumours last year when he stated that playing for Real Madrid is a childhood dream of his. The forward said (via The Independent UK), "Real Madrid is the best club in the world. I don’t want to lie, it is my dream since I was a kid. I was dreaming about this club. We will see. I don’t want to talk about this every day. I don’t have time, but we will talk about my future soon. I think so." He added, "It is like I have said a lot of times: if I leave I will be happy; if I know I stay I will be happy. It is not like if I go I am happy and if I stay then I am unhappy." In the midst of the winter transfer window, The Telegraph reports that Chelsea is set to slap a price tag of £100 million should he choose to leave, despite the Belgian only having eighteen months left on his contract with the club. It is said that both parties would like to see a decision soon despite the forward having claimed that he is ready to wait until the end of the season. In his first six seasons with the London club, Hazard has won two Premier League titles, an FA Cup, the League Cup and the Europa League. Considering Hazard's openly-declared love for Real Madrid and his form this season, it makes sense for Chelsea to slap a hefty price tag on the Belgian. The club further fuelled rumours of his exit after the purchase of Christian Pulisic from Borussia Dortmund for £58m earlier this month. Hazard is currently awaiting a bid from the European Champions and it remains to be seen how this saga will pan out.